The Tiger is the unsung hero of the Hinckley triumph range. Where the iconic Speed Triple is the bike that captures the headlines, believe it or not the Tiger has been merrily going about its business in the background for twenty years, which makes it Triumph’s longest continuously running model. Where the Sprint and Daytona models have come and gone in their various guises, the Tiger is the true stalwart of the Hinckley factory’s lineup. The Tiger 900 was much more than simply Triumph’s take on the GS, it signified that rather than just follow the two-wheeled trends and make tourers such as the Trophy or sportsbikes like the Daytona, Triumph were also willing to take a risk and set themselves aside from the crowd. In 1993 the BMW R100GS was a good seller, but it was far from the all-conquering machine it is today. Adventure bikes were viewed with some skepticism by the biking world and few could see why on earth you would want to take such a large and heavy machine off-road. Going around the world was something done by strange people with dubious personal hygiene, not Hollywood stars and certainly not your average Joe. Triumph took a gamble and it paid off, the Tiger 900 proved a steady, if not outstanding, seller that succeeded in attracting a different kind of owner into the Triumph brand. 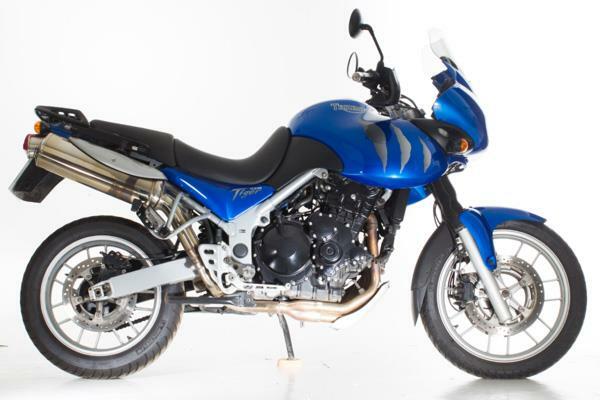 The Tiger 900 is a bike that pops up every now and then in second hand adverts and tends to hang around until the right buyer is found. Due to its age many potential owners are put off as the early Hinckley models are perceived as unreliable and a lot of riders aren’t even aware that the 900 existed at all. 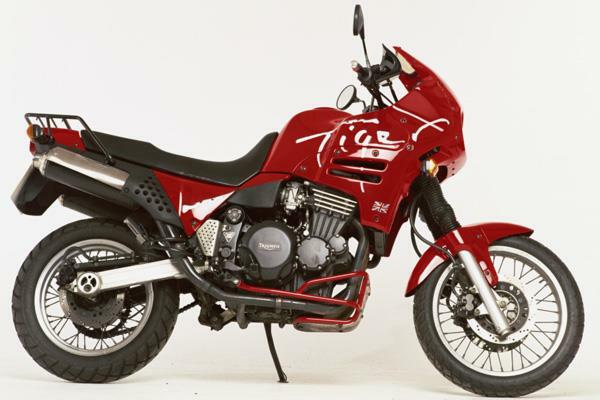 Launched at a time when adventure bikes were seen as quirky alternatives rather than mainstream models, the Tiger 900 didn’t sell in huge numbers and this means that second hand examples are fairly rare when compared to the updated 955i model. However this shouldn’t put buyers off as the reality is that the 900 and 955i are actually pretty similar in all components bar the motor. With a price tag generally under £2,000 you can’t expect too much when it comes to looks on a Tiger 900. As well as being pretty old, Triumph’s early build quality left a bit to be desired however, pick up a good one and you won’t be disappointed. A wide, comfortable seat and good fuel range make this an excellent bike for covering miles. Soft suspension, poor brakes and skinny off-road style tyres mean sporty riding is out of the question, however for hacking along on the Tiger 900 is surprisingly good. In response to the latest version of the Boxer, the R1150GS, Triumph updated the Tiger in 2001 by fitting the more powerful 955i engine. Although re-tuned to produce 104bhp, Triumph’s triple was not only more powerful than the 85bhp Boxer, it was also more responsive. Where the BMW had a lazy feel about it, the Tiger was eager and fast to rev. However this wasn’t enough to put much of a dent in the BMW’s sales. The top heavy nature of the Tiger made it a liability on anything other than tarmac and very soon Triumph recognized this fact. An update in 2002 saw the suspension firmed up before the 2004 over-haul swapped the spoke wheels for cast alternatives – signifying the Tiger was really a road bike and not an off-roader. To help push sales Triumph equipped the Tiger with colour coded panniers as standard, making it not only the cheapest but also the best equipped adventure bike, but while sales were constant, by the same token they weren’t stunning. The Tiger’s look was outdated, the chassis weak and the off-road credibility needed to sell such a model sadly lacking. Where secondhand prices of the GS tend to stay pretty high, the Tiger is an absolute bargain in the used market. 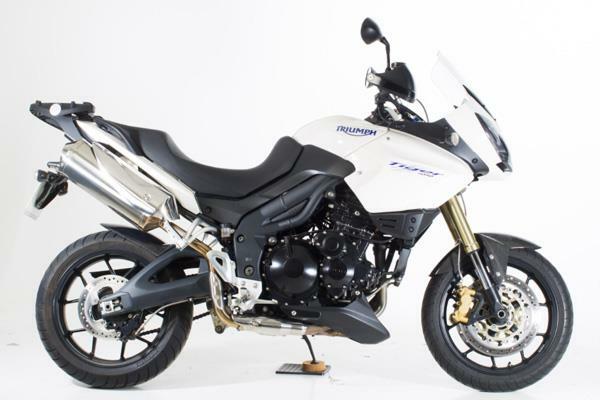 For around £3,300 you can easily get a Tiger 955i that comes fully loaded with panniers, heated grips and a centre stand. If you have no pretence about going off-road then the Triumph makes a superb commuter and an even better grand tourer. The Tiger’s 22-litre tank and frugal 44mpg economy make getting over 200 miles between stops fairly easy while the seat is extremely well padded and the riding position relaxing. A fully fuelled Tiger weighs 270kg and comes with a fairly tall 840mm seat height, making it quite a handful for shorter riders. It’s not that bad when you get used to it, but at first this weight and top-heavy feeling can be slightly intimidating. Overcome this issue and you will be rewarded with a great tourer that has a superb triple motor. The 955i engine contains all the soul of the latest 1050 version, just in a slightly less powerful package. The triple is stacked full of torque, has a wonderful exhaust note and good reliability, making it far more enthralling than a Boxer twin or Honda’s insipid Varadero twin. If you are on a budget and want an easy going tourer with a quirky look then the Tiger 955i is a superb choice. The Tiger 1050 marked a significant shift in the development of Triumph’s adventure bike. Where previous models of Tiger had 17-inch rear and 19-inch front wheels to mimic the off-road look, the Tiger 1050 came with 17-inch front and rear wheels. Triumph had finally admitted that the Tiger was destined for a life away from dirt tracks and had instead positioned it as a comfortable and good looking sports tourer that handled. The Tiger 1050 was night and day compared to the older 955i when it came to fast road riding. The brand new chassis no longer weaved, the inverted forks were fully adjustable and the radial brakes did their job with no fuss or drama. This was a Tiger that contained all the charm of the old model with a far more developed sporty side. It was a brilliant do-it-all bike that was as much fun solo as two up – Triumph had hit the nail on the head. But despite all this it still had a few irritations. When they updated the 955i engine Triumph failed to address its major downside – the gearbox. The increased torque and power, not to mention the glorious triple sound, were all enhanced, however the gearbox remained clunky, imprecise when rushed and annoying. And the suspension, although fully adjustable, was also a bit spongy on the front end. And finally there was the luggage capability. The high side-mounted exhaust looked good, but it took up half of the right hand pannier’s capacity. When it came to serious mile munching the Tiger still wasn’t as good as the BMW, which had shed 20kg and also gained a sporty side in its R1200 update, however for shorter hops and just enjoying the ride the Tiger ticked all the right boxes. The Tiger 1050 is still in the current Triumph line-up and is an excellent second hand buy for those wanting an alternative to the GS. Where BMW are stuck using odd sized wheels, Triumph’s 17-inch items give the Tiger a far more plated feeling through corners. With prices starting at £3,500 it may be lacking the electronic gadgetry that bikes such as the Multistrada come with, however it is almost more charming because of this very fact. 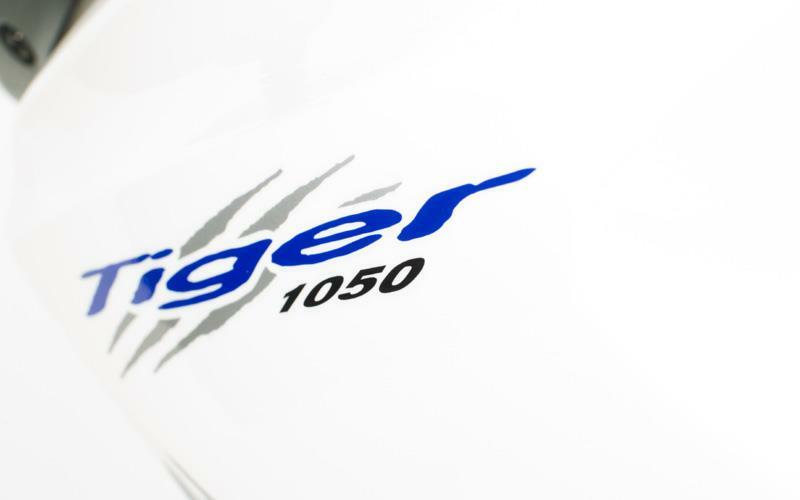 Having made huge steps to increase their build quality since the launch of the original Tiger, you will be hard pushed to find a tatty second hand Tiger 1050. It may have a few miles on the clock, but the condition should be no worse than that of any machine of its age so treat any hacks with suspicion. Get a good one and the Tiger 1050 is a brilliant bike that can be ridden enthusiastically, used to tour Europe or even just employed as a comfortable workhorse to see off the daily commute. Check out 'Best of British Triumph' which charts the turbulent and rich history of one of the world's best-known motorcycle manufacturers, with examinations of every significant bike that contributed to the Triumph story. Watch now over at MCN-TV.com.